Cat came upon an apparent suicide. However, she concludes that drilling a whole through your own skull is not the most effective suicide method, so… it’s gotta be murder. And not just ANY murder: supernaturally enhanced murder. The conspiracy theory goes like this: APRIL (dead woman) was an organ donor with an extremely rare blood-type. She happened to be the perfect match for dying millionaire MARSHALL ZALMAN. Cat believes that Zalman had April killed so he could take her HEART [OK fine, guess I can buy that]. But not just that… Cat also believes that ZALMAN is the BIG BAD behind the serum experiments [now that’s a bit far-fetched]. Cat drags Vincent to a party to confront the alleged criminal mastermind who turns out to be a “wheel-chair-bound dying philanthropist in need of a heart”. Cat questions ZALMAN proving that she can pull off a “bad cop/worse cop/even worse cop” routine all by herself. Vincent tries to stop Catherine, they argue and Zalman ends up having a heart attack [I am sure a lawyer could pass that for “police brutality”]. Vincent is not too thrilled about Cat’s attitude because letting your girlfriend walk around causing heart attacks is probably NOT part of the Hippocratic Oath. Meanwhile, JT decides to test the limits of his newfound self-regenerating abilities. His tests involve rolling down one flight of stairs… Eh… Not to question JT’s scientific methods, but cheerleader Claire was much more daring. Anyway, while JT is struggling with his serum-issue, Tess is busy running a precinct and the last thing she wants is to be involved in “bizarro cases”. So JT decides to find another ally: HEATHER, who is turning out to be the wild-card of this show. Supporting little sister? That’s Heather… Need a wedding planner? Heather is there! Emerging superhuman sidekick in need? Call Heather! I wonder what she will be up to next week... Maybe Heather is behind the experiments [or Matthew… seriously what’s up with Matthew]. Cat is obsessed with proving that Zalman serum-enhanced April and doesn’t want him to get the transplant. Vincent has a “save his life first/ask questions later” attitude. At the end of the day, Cat wants to discover who is behind the experiments so she can “save Vincent”. At the same time, Vincent wants to “save” Cat from getting in trouble as a consequence of his conspiracy theory [which he doesn’t believe]. In Cat’s defence, she had a few arguments to support her crazy claims. April was very sick until a few weeks ago. She started an “experimental treatment” which “supercharged her immune system” and then made a sudden recovery. That definitely screams “serum enhanced heart”. JT tests it and confirms it. He also lets the gang know that he has been developing an antidote, which they don’t get to use because the HEART gets stolen. Since Cat and Vincent were fighting, they decide to go their separate ways, which lasts for… like 5 seconds because those two have a stronger pull than gravity. They track down the HEART THIEF, only to realize that someone killed him. Even more confusing, they find the heart inside a freezer, so looks like whoever stole it didn’t have any use for it. The HEART THIEF’S KILLER locks Vincat inside a freezer. Vincent gets a bit “beast-stubborn” for a while, but Cat convinces him that “freezing to death” is a good excuse to “go full beast”. So Vincat escape the freezer and return to the hospital with the HEART. Zalman’s wife, BELINDA [who looks like the epitome of a gold digger but spent the entire episode telling everyone how devoted she was to her husband] is there to thank Vincent and threaten to sue everyone for obstruction of heart transplant. But BACK TO THE CASE. The co-dependency talk makes Cat have a MIRACULOUS OUT OF NOWHERE BREAKTHROUGH in the case. She realizes that ZALMAN’S WIFE resented him for donating all his money to charity after she devoted her life to him. Turns out WIFEY was behind the HEART HEIST from the beginning. Man… that is one elaborate “kill your husband” plan… whatever happened to good ole poisoning or pillow asphyxiation? On top of coming up with convoluted murder plots, Belinda turns out to be a very determined woman. So she cuts the power of the building to stop the transplant. Cat goes after her and Vincent volunteers to complete Zalman’s surgery [because he can see in the dark and can obtain an entire medical specialty in a minute]. In the end… Vincat save the day. Separately. I wouldn’t say this was my favorite episode of the season, but I thought it was good. I kept feeling that something was missing, but I can’t quite put my finger on it. In any case, there was something I really liked about the Vincat dynamic on Heart of the Matter. Even when they are fighting, they don’t question for a minute that they love each other and WILL spend the rest of their lives together. It would be SO frustrating if they did! Most couples on most shows come to a problem like this and get into a silly fight that ends the relationship… all for the sake of conflict. But not Vincent and Catherine, and that’s one of the things that made S1 so great. What did you think of Heart of the Matter? Thx for your review, Alex! I am so glad you are recapping after each episode. I loved this episode and am loving S3! I'd like to point out that it is Vincent that saves the transplant operation, Cath's little action scene in the cellars is not strictly necessary, since Vincent can operate in the dark anyway. Vincent finds the whereabouts of the heart too. Nevertheless he gives the credit of "saving your husband's heart " to Cath. Always the gentleman. And that babble about co-dependency. 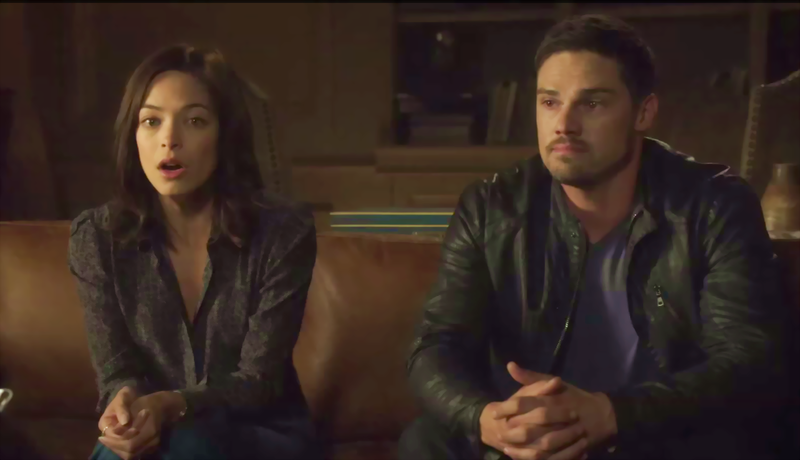 The doc says Vincat have a "sort of co-dependency". From there on it seems a given fact and everybody is running with it. Living with your husband for 20 years and wanting to inherit his money isn't co-dependence. Good old greed is what it is. Anyone with half a brain can see that it isn't their working together or living together that is the problem. What's up with that idea? Are marriages now labeled as co-dependency? Someone of TPTB has a marriage complex.Of course it is the simple fact that a) Vincent is a beast and b) Cath doesn't listen to his worries that are the problems in this relationship. If it isn't something that he says it is something that she thinks he thinks. Which is glaringly obvious even in this painfully clumsy therapy session. It would have been a relief to have a therapist that addressed the real problems. They could simply have said Vincent was prone to violence and gone on from there. . Lying to your therapist? Better not waste your money there, you won't get any results and everyone knows it. Besides they could tell the therapist everything because of the secrecy thing. The fact that people are involuntary violent (because of medication e.g. )isn't an unknown problem. And how Cath gets it together I don't understand. 1) she wants to save Vincent from his primal beast. 2) she wants to find the baddies and for that she needs Vincent and his primal beast talents. These are conflicting objectives and that would tear anyone apart. Thank you for your review and for allowing comments. The therapy session where the doctor gives out his analysis in one session felt a little like speed dating. This episode was troubling because it glamorized Cat's lying to Vincent about a date. She set him up to go on a case. Then she proceeded to have a psychotic episode where she bullied and badgered the victim to get a confession. She almost caused his death. I wonder why Vincent wasn't able to "talk her down" and save her humanity. Instead everyone stood helplessly by until the old man fell over with a heart attack. Tess is now the boss. Instead of taking command, she "begs" Catherine. Yet tries to insist that their relationship has changed. You can't have it both ways, especially when your subordinate not only refuses to listen but then goes off on some sort of quest to prove what isn't true. There is no rhyme or reason to Cat's conclusions. And yes, Yvonne, you are right. Vincent finds the heart, gets them out of the locked freezer (at her command to go full beast) and then saves the surgery too. Yet Cat gets the credit for being the hero. That rather implies that bullying is not only acceptable but deserves our accolades. That unhinged and out of control is okay for an official with a badge and a gun. It was a very scary message. For me, the bullying message over rode the co-dependency message they seemed to bludgeon us with. If we didn't get it from the episode itself, they would drill it into our heads by repeating the words over and over. But I couldn't get over the absolute out of control way Cat was acting. It was worse than "Ever After" where she risked life and limb to capture the bad guy. This time she showed no humanity at all, she was totally unhinged. The episode scared me that they would have to "find who they are apart" like last season. Since lessons were not learned in season 2, they are trying a different type of tired trope. Now it is co-dependency. But Cat can't let Vincent slip back into beast mode so they can't be apart. He is now only allowed to beast out on her command for a duration and extent she dictates. So it will be interesting to see if Vincent has to save himself like last season, with no help from anyone, or will he just be on a leash heeling at her side. On the other hand, maybe he has to save her from losing control and having meltdowns week after week. Maybe he has to save her humanity.